Roughly a week after its initial release, iOS 8 is now installed on 46% of devices connected to the App Store, according to the latest numbers posted on Apple's App Store developer support page (via iClarified). 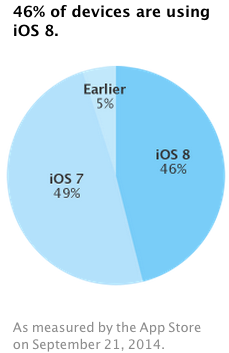 The numbers also indicate that 49% of users are using iOS 7 while 5% of users are on older versions of iOS. Earlier this month, Apple's analytics indicated that 92% of devices connected to the App Store were using iOS 7, while 7% were using iOS 6 and 1% were on earlier versions of the mobile operating system. In December 2013, iOS 7 usage was at 74 percent, which jumped to 78 percent later that month. In late January, iOS 7 usage was at 80% and then scaled to 85% in March. iOS 8 was released last Tuesday and brought several new features like Continuity, third-party keyboards, interactive notifications and more. However, a number of users have experienced a variety of problems with the operating system's initial release, including irregular battery drain, slow Wi-Fi, app crashes, and more. screw it, develop for iOS 8. people with iPhone 4's need to upgrade anyways. Very arrogant attitude. Software developers don't make snarky comments about people with an iPhone 4, they figure out the cost of supporting iOS 7 vs. the cost of not supporting iOS 7 (losing customers and cost to adapt to iOS 8) and make rational decisions based on this. Imagine my software is used in a company that bought 1,000 iPhone 4 for their users a while ago. These phones work just fine, at least the majority. Do you think they should pay out more than half a million dollars just to please you? Wow! No other company could achieve this...Almost half of all users using the latest OS in under a week! No half of the visitors to the App Store have been using iOS8 - No surprise really as everyone with iOS8 will need to visit the App Store to update the no longer working apps. That's pretty good for a company that forces OS updates. I know a number of people who want to upgrade to iOS 8 (and some still on iOS 6) and their issue is they don't have enough free space and they can't decide what they want to delete. You won't have to delete anything. Its that sort of thinking that allows Apple to get away with their premature obsoletion of older devices. Why do iPhone 4 users have to buy a new phone just to do exactly what they could do on it before? I wonder how many in this percentage actually chose to download this update. It downloaded uninvited on 3 of my devices. If it was such a great update Apple wouldn't need to do this ... forced downloads. So 46% of "ALL" iPhones out in the world today are running iOS8 are they? Only iOS devices which have accessed the App Store in the past week. Kind of like how Google measure it. Holding on to 7 until a lot of all those bugs are squashed. Wondering what happened to 'It just works'? I remember getting the first releases of Leopard and Lion and putting up with a lot of annoying bugs back then as well. People need to stop revising Apple's history. They made mistakes under Jobs as well. Solution is to upgrade through iTunes on PC/Mac. No need for extra space to extract the files. PS: Appears that others have pointed that out too.